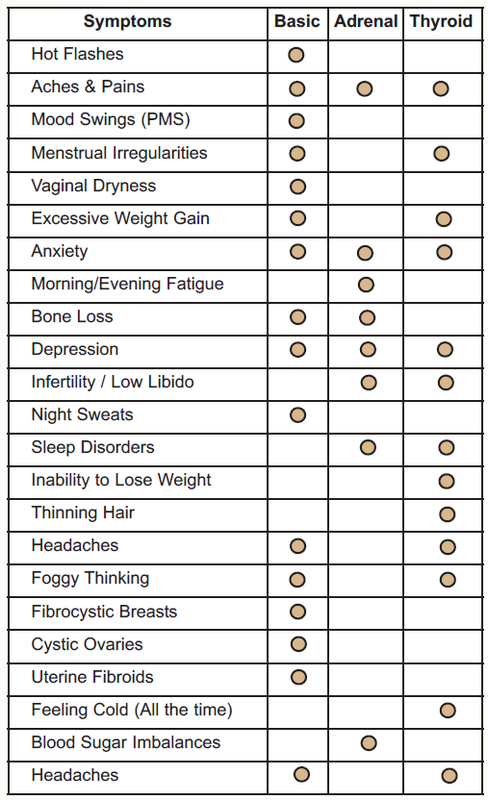 If you experience the following persistent symptoms or have had trouble with any of these systems over time, you may be indicated for hormonal testing. These simple hormonal tests will indicate if you are a candidate for bio-identical hormone replacement therapies. Don’t allow yourself to suffer from these symptoms any longer – take back control of your life! Throughout the aging process, our bodies change and we develop certain deficiencies that occur due to life changes and genetics. We develop various chronic or persistent symptoms that we put off to “old age” when in fact these conditions are a result of over/under glandular activity. Hormones decline as we age; bioidentical hormone therapy replaces the hormones that your body needs to function. Bioidentical hormones are molecule-by-molecule, exactly the same as the hormones present in the human body. When a woman reaches menopause, the production of estrogen and progesterone decreases significantly. HRT is a means of replacing these hormones that are no longer being produced by the body. This type of therapy is usually commenced at menopause or may be started while a woman is in the perimenopausal phase (nearing menopause). HRT is not medically advised for all women so it is crucial that the decision be made on an individual basis after a complete review and consultation of your medical history. In recent years the dynamic of replacing and correcting hormonal levels in women have allowed us to further understand the inter-relationship of various disorders and the important role that hormones play in correcting various physical disorders. New combination therapies that utilizes natural supplements in conjunction with HRT have proven effective for sleep, anxiety, and chronic fatigue disorders. These natural replacements now allows us to treat the disorder rather than mask the symptoms through prescription medications. Don’t Get Frustrated Get Help! Tired of feelings that you are getting old and rationalizing that it is part of the aging process? Frustrated with conventional medicine where your symptoms are dismissed as psychological or treated clinically with prescription drugs? Get help! Most healthcare professionals are not trained or have taken the additional medical training and education necessary to effectively evaluate or diagnose the symptoms problematic with hormone deficiencies or to effectively treat your complaints and offer “real solutions”. The inter-relationship of hormone deficiencies and your health concerns are multi-factorial which requires other modalities of treatment in addition to replacing hormonal levels to normal levels. Integrative medical therapies are used in the form of nutritional supplements to ensure your body’s biochemistry is performing at optimum levels. Diet, nutrition, and exercise is also prescribed if your condition indicates. In combination, these regenerative therapies allow for the alleviation of or elimination of your symptoms as well as optimal health. Not Happy with Yourself – Take the test! During your initial consultation with Tracy, she will go over the various concerns and symptoms you are suffering from in a manner that will make sense to you. She will explain in detail the various bio-feedback mechanisms that may help you understand why these symptoms are occuring. During this initial visit Tracy will determine whether you may be a candidate for bio-identical hormone replacement. If you are medically indicated, she will order a hormonal panel which may incorporate a number of various types of tests to determine the probable causes for your indicated health concerns and possibly some health risk issues you may not even become aware of. Bio-Identical Hormone Replacement Therapies are safe, effective, and the results are dramatic and immediate. HRT is not HGH (Human Growth Hormones) but are your bodies own natural hormones that through the aging process are “out of balance”. These inbalances can be responsible for many of the symptoms associated with sexual desire, weight gain, fatigue, and many other health processes. HRT therapy is very safe when the proper testing, protocols, and conjunctive therapies are applied and your hormone levels are corrected. We ensure our patient’s health through education of the aging process and preparing you for the “lifestyle choices” you can do to reverse or defer the aging process. The solutions we offer are natural, immediate and very effective. By feeling better from the inside/out makes for a healthy, energetic “new you” that you may have thought was no longer possible. What makes us different is the standard of care you will receive from Tracy and her staff. Our personal “one-on-one” approach to each patient in consulting with, educating, and in monitoring your progress ensure that the results you receive meet or exceed your expectations. We explain in great detail what you can expect and show you the path to a new healthier lifestyle. You are as young as you feel – make the most of your life! Join the millions of women that have made a difference in their lives. See for yourself if HRT is right for you and setup your initial consultation. Take control over your life!